Paradise Bay has quite a name to live up to and, all in all, it gets quite close. The bay is located on the northernmost tip of Malta near Cirkewwa, where the ferry leaves for Gozo. The water in the bay is that Mediterranean mixture of clear turquoise and dark blue, and the sandy beach is ideal for any kind of beach-goer, including families with children. With a car park and public transport connections, Paradise Bay is easy to get to and a favourite among both locals and tourists. 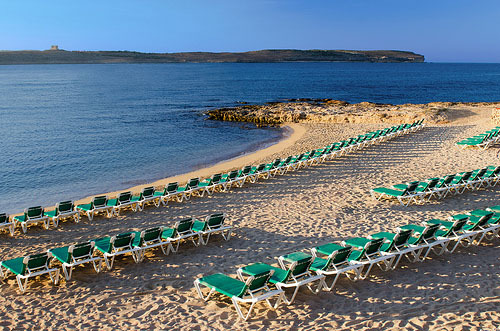 The bay was awarded a Beach Quality award in 2012, and it remains one of Malta’s main summertime attractions. Fringed by cliffs and boulders, the bay is sheltered and very secluded, but it then opens up to the wide open sea with scenic views across to the islands of Comino and Gozo. 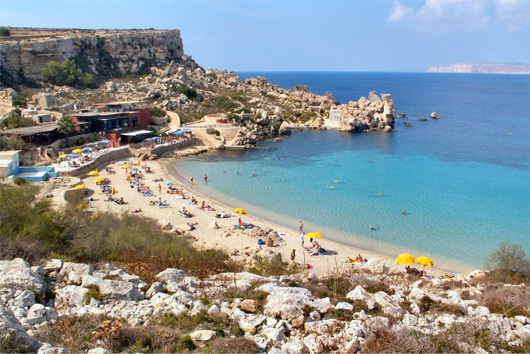 In fact, the area around Paradise Bay is well frequented by hikers, who take delight in traversing this isolated and tranquil region of Malta and then heading down to the bay for a refreshing dip. There are few amenities around the bay. The Paradise Bay Resort Hotel is located at one end and the Cirkewwa ferry terminal – from where ferries leave to Comino and Gozo – is nearby. Otherwise, the bay is quite cut off. That said, it is one of the most popular sandy beaches in Malta and gets very busy during summer, particularly at the weekend. The beach area itself has a bar and a restaurant, so ice cream, snacks, meals and drinks are readily available. The restaurant is also a popular dinnertime location and is well known for organising barbecue dinners for groups of people when ordered beforehand. Perhaps the beach’s only drawback are the steep steps that lead down to it from the car park. This is a small price to pay, however, when a day of relaxation in the sun awaits at the bottom. The beach concession offers some sunbeds and deckchairs, but one must get to the beach early on in the day to secure a spot. What’s more, even though the beach and bay are quite small, there are still some water sports on offer, such as jet skiing, and the clear water makes it a worthwhile location for snorkelling. The cliffs above the bay are perfect at sunset when you have spectacular skies and hazy views over to Comino and Gozo. The countryside of this northern and isolated region of Malta is ideal for rambling. Click here for more info on Paradise Bay and its accommodation.